In our last blog, we started talking about the pillow of your dreams. The first thing to remember when looking for the pillow of your dreams is to know the position that you sleep in during the night. Though we all may move around in our sleep, most favor one sleeping position over the other. However, if you are one of those that sleep in all types of positions, do not fear! There is also a pillow for you. Read last week’s blog and learn more about picking a pillow according to your sleeping position. This week, we are going to be looking at the various pillow fill types and what that means for your sleep. Down pillows usually embody a sense of luxury and, really, they should for they are usually an investment, but an investment well worth making. Quality down pillows cradle your head due to the air pockets that form from the intertwining of the light, filaments of the feathers. Down pillows are an excellent choice for those looking to invest in a luxurious pillow that will provide fluffy comfort for years to come. If you are looking for great neck support, a memory foam pillow may be what you need. Memory foam pillows are called as such due to their ability to mold to your head and neck, yet when not in use, return to their original form. These type of pillows reduce pressure points that other pillows can cause and come in a variety of shapes to fit your sleeping habits. Latex pillows also offer comfort and support for your head and neck through their springy and resilient qualities. These pillows usually come in a solid core form or with a shredded filling that won’t squash down over time. If you suffer from allergies, a latex pillow might be the the one for you due to their hypoallergenic, antimicrobial, mildew proof, and dust mite resistance. If these types of pillows don’t suit your fancy, don’t worry! 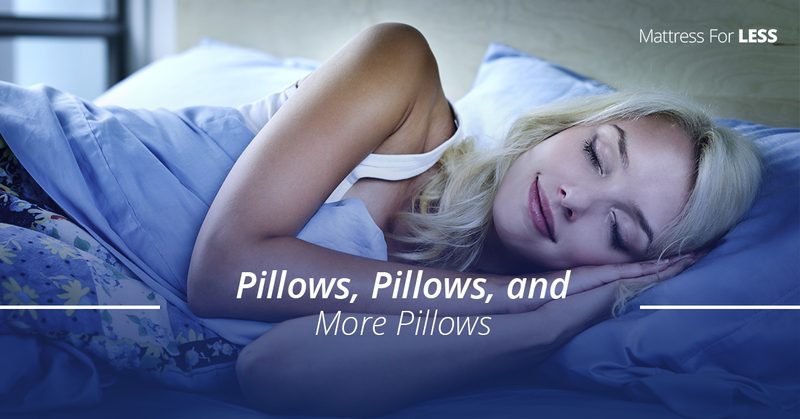 There are more than a few other types of pillows to choose from. Other types of pillows include gel pillows, buckwheat pillows, aromatherapy pillows, water pillows, and more. Really, in today’s world, if you can’t seem to get restful sleep that leaves you feeling energetic and excited to tackle the day, there is most likely a sleep solution out there for you. Perhaps you have the pillow of your dreams, but you are unsure of your mattress. If you live in the Newington area, Mattress for Less can help you find the mattress that will help you sleep through the night to feel rested the next day. We offer mattresses from leading brands and offer no money down with zero percent financing. We can even provide same day pickup and delivery. Not interested in a mattress? We also offer headboards, bed frames, mattress protectors and more. We are your Top Rated Local® bedding store for the Newington area, stop by our warehouse and let us help you find the perfect mattress.